Real Madrid: Navas, Danilo, Ramos, Varane, Carvajal, Modric, Kroos, Isco, Rodriguez, Ronaldo, Benzema. Atletico Madrid: Oblak, Juanfran, Godin, Gimenez, Filipe Luis, Gabi, Saul, Augusto, Koke, Griezmann, Torres. Being honest, Zinedine Zidane hasn't really turned anything around since replacing Rafael Benitez as Real Madrid coach. Their title bid has died under him. And with that I bid you goodbye. Enjoy your evenings - especially if you're an Atletico fan. I think we can rule out a Real Madrid title challenge now. They are nine points off Barcelona, who have a game in hand on the capital sides. 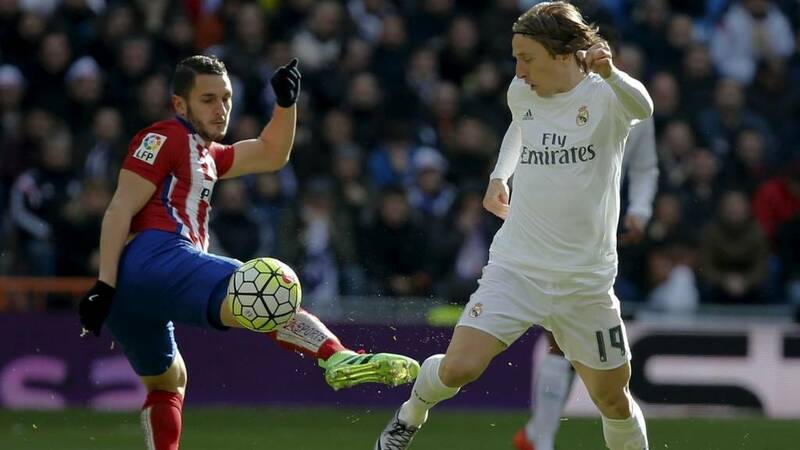 Atletico remain in the title race - just - as they move to within five points of the Catalans. Atletico are seeing the final seconds out at the other end. Almost over. Three minutes added on. Can Real find an equaliser? Raymond Tolulope: Real Madrid should just focus on the UCL now....let them think of rebuilding next season. Inches away from a Real Madrid equaliser. Jese slips in Danilo, but his effort from the edge of the area goes just wide of the far post. Diego Simeone is furious on the sideline at his side conceding that chance. Atletico Madrid have what has become a rare attack but Antoine Griezmann's effort from just outside the box is curled well over. Will he and Atletico regret that? For the second time today, Cristiano Ronaldo has a header saved by keeper Jan Oblak. This one is more understandable than his first because he was heavily marked. Atletico Madrid make a change up front as Angel Correa comes on for Fernando Torres, who has been fairly quiet today. Nine minutes left. Diego Godin goes down holding his knee after being pushed over by Luka Modric. The frustrated home fans are furious and make a lot of noise to express their displeasure. Godin is fine, by the way, he gets up and runs off about 30 seconds later. Atletico make a change in midfield as Augusto Fernandez comes off for fellow Argentine Matias Kranevitter. Atletico Madrid are lucky not to concede a penalty here as Luciano Vietto seems to barge Danilo over in the box. A big let-off for Diego Simeone's perpetually overachieving side. Fifteen minutes to go and Atletico are defending well. As usual. Jese's first action is to get the ball to teenager Borja Mayoral but his shot looks like it's going wide until Atletico keeper Jan Oblak catches it anyway. Real Madrid boss Zinedine Zidane makes his final change as Jese replaces Isco. There aren't many players in the world you'd back more to score a header than Cristiano Ronaldo, but the Portuguese superstar should do better from Dani Carvajal's cross. His headed effort is straight at Jan Oblak in the Atletico goal. Chances at both ends as Saul Níguez forces a save from Keylor Navas and moments later Lucas Vazquez misses for Real. Bayern Munich move another step closer to a fourth consecutive Bundesliga title as they beat Wolfsburg thanks to goals from Kingsley Coman and Robert Lewandowski.